I am a bit of a hoarder. 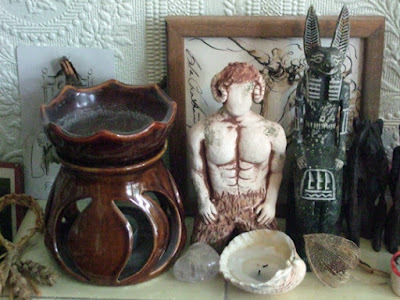 My witch room is cluttered with all sorts of things, as you can see from the photo of just a tiny section of my mantelpiece. On it you can see a corn dolly, a tarot card, an oil burner, a drawing of a unicorn, a statue of a ram-horned god, a statue of Anubis, a wooden monkey, a quartz crystal, a shell with a candle in it, a Chinese lantern seed pod and the edge of an incense cone dish. All of those things have some sort of sentimental meaning to me or were once used for spells or rituals. However, the Autumn Equinox - which is this Sunday - is a good time to do some decluttering. Perhaps that Chinese lantern could really be put in the compost bin, the candle fully burnt and the shell returned to the beach. The God statues won't be leaving, but the oil burner might go. I inherited the oil burner from my mother - along with a bottle of essential rose oil. However, I have recently got a new oil burner that I think looks much nicer. It was part of Wicca Moon's Wheel of the Year boxed set for the Autumn Equinox. 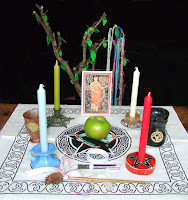 You can see it in the photo below - along with the bottle of seasonal ritual oil and a candle that also came in the kit - and also see it on my altar in the photo to the right. I don't need two oil burners and it makes sense to pass one of them on to someone who hasn't got one at all - but which do I keep, or do I keep both just a little longer? The newer one looks much nicer and is more pagan, but the older one has sentimental value. 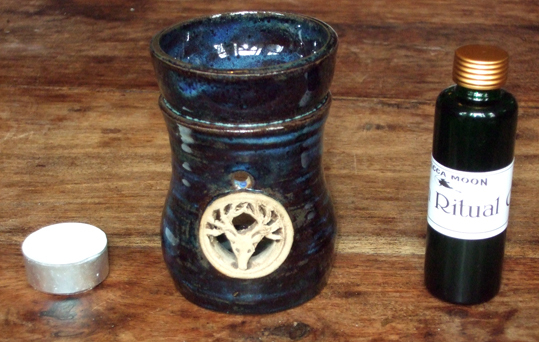 I will be using my lovely new oil burner for the first time in my Autumn Equinox rite this weekend. After that I will make a decision. What do you think? Should I keep both, or let go of the old to make room for the new? Keep both , especaily if one is of sentimental value. I've been persuaded - I will keep both. Perhaps the monkeys will go instead :) Thanks for the comments!